Is there a correlation between a club’s market value and their Premier League position? It is unsurprising that people automatically think that if clubs spend more and are worth millions of pounds, they are more likely to finish at the top of the Premier League table. However, this simply is not true. For instance, smaller clubs such as Huddersfield Town, don’t necessarily have the resources to spend around £70 million on one player like larger clubs such as Manchester City, but it doesn’t mean they are destined to become relegated. 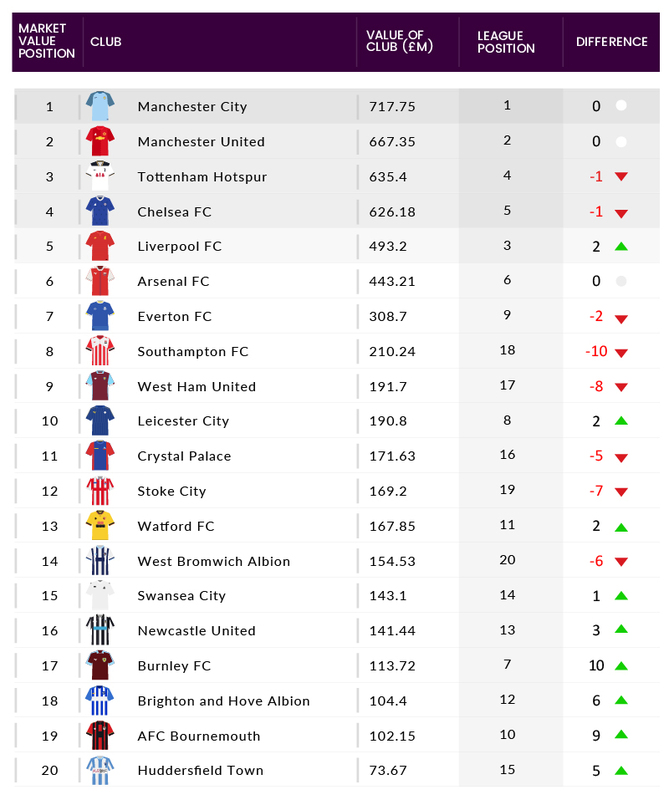 As a result, Ticketgum.com found out the difference between a club’s market league position and a club’s position in the Premier League during the current 2017/18 season, utilising statistics from football data website Transfermarkt.co.uk. After analysing figures, Ticketgum.com found that Manchester City and Manchester United are worth £717.75m and £667.35m, respectively, and currently sit in first and second place in the Premier League table, implying that there is a correlation between money and success. However, despite there being no difference between the top two clubs in the Premier League, when looking at the clubs with some of the lowest market values in the Premier League, and comparing this position to their current standing in the league table, Ticketgum.com found there is no consistent correlation and uncovered some interesting results. After analysing the figures in detail, Ticketgum.com found that Burnley FC had one of the most shocking results of all 20 teams in the Premier League this season. The Clarets currently rank 17th in market value, however, due to a remarkable 11 wins and 9 losses so far, this season, they are sat in 7th spot in the league table – a staggering 10 spaces ahead of their market value position, and just 5 points behind Arsenal. AFC Bournemouth have the second-highest positive difference in market value to league position. The Cherries have a market value of £102.15m and rank in 19th place, however, they are currently sat 10th in the Premier League table – a difference of 9 spaces. In addition, The Seagulls rank just ahead of AFC Bournemouth with a market value of £104.40m, ranking in 18th place. 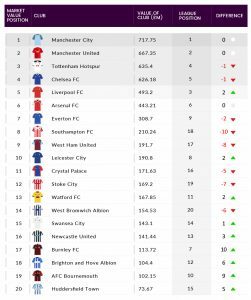 In spite of this, Brighton & Hove Albion currently have a difference of 6 spaces between market value and league position, sitting in 12th position in the Premier League table. Huddersfield Town have the lowest market value in the Premier League – perhaps understandably after spending the entirety of their football history in lower tier League One and Championship. The Terriers began their first ever season in the Premier League with a market value of just over £70 million (£73.67m) – £644.08m less than table-toppers Manchester City. Despite this, the team is currently sitting in 15th place in England’s top-tier league table – five places higher than their market worth. On the other hand, Southampton FC has one of the worst results in the Premier League. Despite having an advantageous market value of £210.24m, and ranking 8th highest of all 20 Premier League teams, the Saints position in the league table is 10 places lower, sitting inside the relegation zone in 18th position after a dreadful season having lost 12 games and won just five. West Ham United, Crystal Palace and Stoke City have negative differences between their market value and league position. 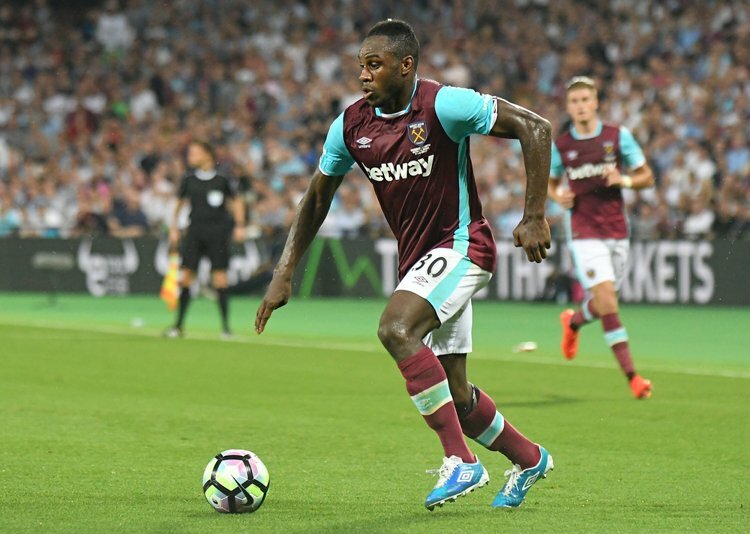 The Hammers rank in 9th place for market value, however are positioned in 17th spot and just outside the relegation zone. The Eagles rank in 11th position and the Potters are just behind in 12th place. However, both teams are at the bottom end of the Premier League table, with Crystal Palace just a few spaces away from the relegation zone, in 16th position, and Stoke City is in the relegation zone, at 19th. West Bromwich Albion are set to be relegated this season after a string of poor results, who are sitting in 20th position with a mere 20 points – 58 points behind first place Manchester City. Despite this, West Brom have a respectable market value of £154.53m, however, this does not mean that results are guaranteed; clearly seen by just 3 wins and a staggering 17 losses in all Premier League games this season.